First, the bad news: The best and most reliable way to find out if a brand or garment will last is simple trial and error. Quality tests can fail, great brands can create dud items, and there is no foolproof way to screen for durability. Seams: I'm no seamstress, but even we laypeople can generally spot shoddy seams. Look for loose threads and broken stitches, for starters. Also remember that a higher density of stitches per inch is generally better, and stitching should be relatively tight. (Though not so tight that it prevents the garment from moving fluidly and freely.) Serged seams or double straight seams are generally stronger and, therefore, preferable to single straight seams. Lining and reinforcement: Certain types of fabric reinforcement are hard to spot, but take a peek regardless. Look inside - especially blazers and bottoms - to see if you can spot any facing around zippers, buttons, or other high-use areas. Also check for lining: A lined skirt, jacket, dress, or pair of pants is usually a better investment than an unlined one. Lined garments glide on easier and layer better, so they're worth more. Material: Everyone has her own material preferences, but in my opinion natural fibers are always a good bet. Wool, silk, cotton, and linen beat out nylon, polyester, and acetate any day. Especially if you're thrifting, give fiber content the once-over and spring for natural fibers over synthetics. They'll last longer and launder easier. Weight: Obviously there are silk blouses that feel lighter than air and are well worth purchasing, but I generally subscribe to the idea that heavier is better. A wool blazer that weighs next to nothing likely lacks a lining, real pockets, and quality notions. It may also be constructed from a flimsy textile. Heavier cottons age better, dense linens last longer ... not foolproof, by any means, but if you pick up a garment that SHOULD feel heavy and dense but doesn't, keep looking. Brand: I'm reluctant to condone label obsession - especially since I frequently fight the urge to thrift a designer garment simply because it's designer - but the fact is that clothing brands earn their reputations. They won't stamp their names on garments that don't meet their standards. So if you've got two pairs of jeans in-hand at Marshalls, one Levi's and one an unknown-to-you brand, you'd be safer going with the Levi's. Care instructions: No matter the situation, ALWAYS check care instructions. A "dry clean only" garment will cost you far more in the long haul than its retail price. But bear in mind, too, that repeated trips to a second-rate dry cleaner can ruin a garment - stiffen, shrink, or otherwise alter its original condition. 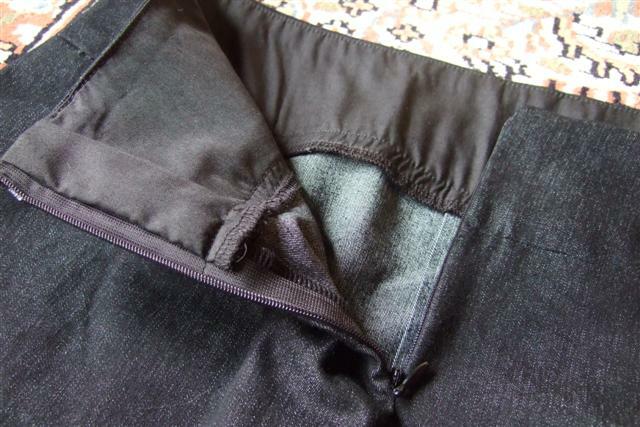 The flip side is that shoddily-constructed washables will often come undone in the machine. So examine care instructions and construction with the same rigor. Stains, rips, and other obvious damage: Yeah, I know. But garments can get ruined in department stores just as easily as they can get ruined in thrift stores. Don't forget to give every potential purchase the damage-once-over. Again, none of these tests are foolproof, but if you want to train yourself to shop for quality and longevity, they're a good place to start! How do YOU test a garment for quality? Any other construction-related tips from those who make their own clothing? How do you feel about garment weight? Natural fibers? Do you have a go-to brand that you'll trust to create and sell quality clothing till the end of time?